I feel pretty good about today’s lecture, though things got a little rushed at the end. Three-resistor voltage divider for the first question. You have sensor whose resistance varies from 1kΩ to 4kΩ with the property it measures and a 5v power supply. 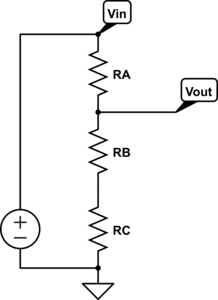 Design a circuit whose output voltage varies from 1v (at 1kΩ) to 2v (at 4kΩ). Several students realized that the first question was a hint for the second one and that the variable resistor had to be RB or RC, and could set up the equations and solve for RA and RC. This is a better performance than on Monday’s “do now”, but only about 1/3 of the class got it completely, and several of them were not confident of their results, so we again took time to go over the whole solution. I think that everyone (or almost everyone) understood the design process and how to set up and solve the equations by the end of the presentation, which I drew out of the students as much as possible. I also mentioned that we could have solved the problem with a different circuit (putting RC in parallel with RB instead of in series), but did not further elaborate on that point. The do-now plus going over the solution took about 33 minutes, which is a little more time than I’d like to be spending on these questions. It would be good to get the time down to 15 minutes, but I don’t see how to do that without losing half the class. If the problems are easy enough that everyone gets them, then there is no point to taking up any class time with them, and if they are hard enough that 1/3 to 2/3 of the class don’t get them, then they need to be gone over in class. After the do-now, we spent a little time discussing the “fit” command of gnuplot, since the students have to fit models to the data they collect tomorrow, and I’m not providing them a script this time (though they can modify the script that was provided in the first lab). Finally, we got to the theoretical meat of the class—we discussed what sound was (ending up with variations in pressure for a fluid, though we discussed briefly transverse and shear waves in solids). Then I introduced microphones as transducers, trying to get the students to remember their elementary mechanics, so that we could do pressure→force→displacement→1/capacitance→voltage for electret mics. The hardest part was getting students to remember that a spring-mounted object had force proportional to displacement (a lot remembered the energy was somehow related to displacement squared and got stuck on that formula). I suspect that the local physics department would not be seeing a high score on the Force Concept Inventory for students coming out of their physics classes, as a lot of them seem to have concentrated on cramming formulas rather than learning fundamental concepts. Someone did remember Q=CV and someone else could reason from wanting voltage proportional to displacement to needing constant charge which let me introduce both conventional capacitance microphone (with a large resistor to voltage source) and electrets. I also explained that the electret had an enormous resistance, so we couldn’t get any measurable current out of it, and we needed an FET transistor to convert the voltage to a current. Because both the do-now and extracting vague memories of physics from the students took longer than I had planned, we were a bit rushed for the last part of the lesson, which was a simple model of Ids vs Vds for the FET output stage of the electret mic. I asked for advice on drawing the plots for resistors and for current sources, and got the appropriate straight lines. I then drew a smooth transition between them and claimed that the simple FET models usually consisted of a linear region at low voltage (which my co-instructor refers to as the “triode” region, a usage I’ve seen in some other presentations) and a saturation region at high voltage, and that we usually try to stay out of the sublinear region in between. I also said that the saturation region is not really constant, but has a slight upward slope, since they will be measuring the I-vs-V characteristic of the electret microphones tomorrow, and they will certainly be observing that. The lab handout gives them 4 models to fit: linear, constant current, an empirical blend of the two, and a model that allows current increase in the saturation region. Neither the 3rd nor the 4th model match the ones usually used in circuit simulators, but I had trouble fitting parameters to those models, even with voltage-modulated channel lengths, so I gave up and produced simple models with few parameters that can be fit pretty easily. We’ll be revisiting FETs again before the power-amp lab (where they’ll use pMOS and nMOS power FETs to make a class-D amplifier). Somewhere around then, I’ll have to give them some usable models for how saturation current varies with gate voltage, which I deliberately did not cover in this lecture. designing a pull-up resistor to bias the mic into its normal operating range (in the saturation region) and observing the microphone output on the oscilloscope. I also asked students to hook up their loudspeakers to the signal generators, to provide known inputs to the mic, and some other little stuff, but I’ll probably be happy if everyone gets the first part done and manages to observe waveforms on the scope. On Friday, most of the lecture will be standard EE stuff by my co-instructor (probably current sources, Thévenin equivalents, and Norton equivalents). I may have a do-now question at the beginning of the class, if I can come up with one that I think is pedagogically useful. Today’s class went much better than last Friday’s. You have sensor whose resistance varies from 1kΩ to 4kΩ with the property it measures. 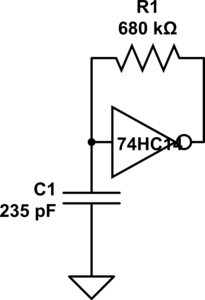 Design a circuit whose output voltage varies from 1v (at 1kΩ) to 2v (at 4kΩ). I gave the students 10 minutes to work on this at the beginning of class. A good question to prompt discussion (according to the peer instruction blogs and websites) should be answerable by 30–80% of the students. More than that and the question was too easy to be useful, and less than that and the question is too hard for peer discussion to be worthwhile. It turned out that no one had gotten it after 10 minutes (too hard to use as a peer instruction question), so we used it as the basis for a class discussion. Almost everyone realized that the desired circuit was a voltage source and a voltage divider (not too surprising, since that’s the only circuit they’ve used so far). The majority also realized that the variable resistor had to be on the lower leg, between the output and ground, and a couple of the students could articulate why. I suggested the common heuristic of trying extreme values (0 and ∞) for the variable resistor, to see whether the output voltage would go up or down as the resistance changed. The students were then able to set up the simultaneous equations to solve for the input voltage and the fixed resistance. The hole in everyone’s thinking when working on the problem initially is that they had not considered the voltage of the source as a design parameter to solve for, though one student had asked about it. This was the blind spot I was expecting, so I was able to use it as a teachable moment. After we had the equations set up using mainly student input, I gave the students another minute or two to solve them, and about half the class was able to solve them correctly in the time provided. (I suspect that everyone could have if given enough time, but I didn’t want to take any more time in class—those who didn’t solve it in class could practice their algebra at home if they needed to.) One student had made an algebra or arithmetic mistake, and gotten a source voltage smaller than one of the desired output voltages. This was also a good mistake to get, since we could use it to talk about sanity checks on results. I think that the 20 or so minutes of class was well spent, as we uncovered several important misconceptions, and raised awareness of all unspecified variables as potential design parameters, reasoning using extreme values, and the usefulness of sanity checks. After that, we spent some time discussing different temperature sensors. From the students, I got thermistor, infrared thermometer, mercury thermometer+camera, and enzyme + other sensor (pH, conductivity, color, …). I added RTD, silicon band-gap, and thermocouple to the mix. We talked a little about the advantages and disadvantages of each. At the end, I also threw in bimetallic strips and tilt switches for one-bit digitization of temperature. I wonder how many students will look at the thermostats in their apartments and try to figure out what sensor they include. For the remainder of the class, we talked about gnuplot commands, particularly the “plot” command. After class, several of us went over to the lab, where my son met us and helped the students install the DataLoger, python, pyserial, the Arduino environment, and gnuplot. While he was doing that, I borrowed an Uno R3 Arduino board and made sure that all the computers in the labs had the drivers installed for it. We had 2 installation failures: on one Windows laptop, my son was unable to get the serial ports to work and one Mac laptop couldn’t install gnuplot. I did not look at the problem on the Windows machine (the student had to leave for class before I became available), but I don’t know that I could have done anything—my son knows more about Windows than I do, so if he was stuck, I probably would have been also. On Wednesday, I’ll start with another “do now” question, though I’m not sure what it’ll be on, since I’ve not yet gotten to the material for this week’s lab: how a microphone works. I’ll do a tiny bit of gnuplot (just the “fit” command) and try to get through how a microphone works and an idealized i-vs-v plot for the FET output of the microphone. 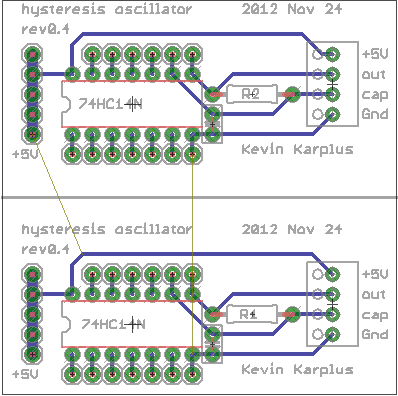 Now that we’re using a 74HC14 Schmitt trigger in the capacitive touch sensor for the hysteresis oscillator, that lab can be the first soldering project, in addition to learning about hysteresis. I tried laying out a very compact PC board for the students to solder (still requiring them to do some design—they’ll have to breadboard their design first to get appropriate R and C values). I came up with one very compact design that could get 4 copies into the 50mm×50mm limit of the $1 boards from ITEAD, making the boards only 25¢ each. 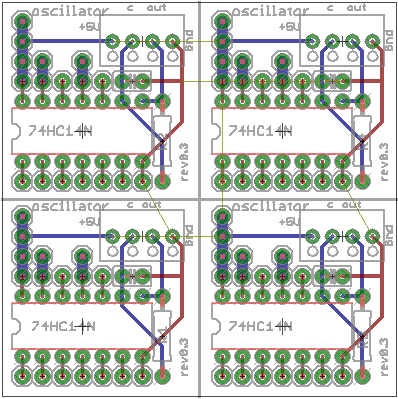 Compact layout to get 4 hysteresis oscillator boards out of one 50mm×50mm board. The gutters are pretty narrow, though, and I’m not sure I’m skillful enough with the board shears to cut that accurately. The yellow “airwires” are Eagle telling me that the Gnd and +5V wires are not connected between the different copies. It seemed a little silly to try to squeeze the price down to 25¢, when the other parts cost 90¢: 59¢ for the screw terminals, 28¢ for the Schmitt trigger chip, 1¢ for the resistor, and 2¢ for the capacitor. With this layout it is also a little tricky for the students to properly wire the unused inputs high. Given the high risk of ruining the boards trying to cute them with the board shears, I decided to redesign for a 50¢ board. Much looser layout, having only two copies on the 50mm x 50mm board. This version makes it easier for the students to see how things are connected, and has lots of room for the board shears to make the cut. The lab would now require that the students measure the thresholds of the Schmitt trigger, breadboard the hysteresis oscillator, make a touch pad out of foil and packing tape, measure the frequency of the oscillation to estimate the touch pad capacitance, adjust the parameters of the Arduino program to match the frequencies of their oscillator, solder up the board, and demonstrate it working to control an LED. I think that is plenty for a 3-hour lab. When I set up the web pages for the course, I’ll try to make sure I put the Eagle design files (.brd and .sch) for each board the students use on the web, so that future instructors can easily order more copies of the board, even if my laptop gets run over by a beer truck. That will also make it easier for instructors at other schools to try to duplicate the course. Since I decided in Capacitive sensing with Schmitt trigger to use an off-the-shelf Schmitt trigger chip (like a 74HC14) and a very simple oscillator, I needed to rethink the lab and expand it. Students will no longer be spending much time on building the circuit, so we need to play with other uses for the oscillator circuit and other applications of Schmitt triggers. After characterizing the inverter, they should design and measure one-inverter oscillators for different frequencies, using different combinations of resistors and capacitors (some low-resistance, high-capacitance designs and some high-resistance, low-capacitance designs). They should show computations for the frequency using the threshold voltages and the R and C values. It might be worthwhile to have them estimate the parasitic capacitance of the input to the Schmitt trigger (together with the wiring). Then they should measure capacitance by hooking up an unknown capacitor with a known resistance, measuring the frequency, and computing the capacitance. We would have to make up some unknowns with a wide range of different values. Finally, they should make a capacitive touch pad (a piece of aluminum foil covered with a layer of packing tape). I’ve decided that I like foil covered with packing tape better than foil wrapped in plastic wrap. The tape may be a bit thicker, but the lack of an air bubble makes for a much more repeatable capacitance, and it is less likely to fall apart when handled. Modified circuit for longer period. C1 is just the stray capacitance of the touch sensor, with no deliberately added capacitance. Without a touch sensor, it oscillates at about 10 kHz. With an untouched touch sensor, the frequency drops to about 9.5 kHz. With a touched sensor, the frequency drops further to around 6.7 kHz. I can make the touch sensor have a bigger relative frequency change by reducing the capacitor to 157pF (3 470pF in series), from 15kHz down to 8kHz. This oscillator works fine with the code I wrote for the op-amp oscillator. Neither the resistor nor the capacitor values are particularly critical (as long as the addition of about 140pF from the touch drops the frequency enough to be measurable). The Schmitt trigger is a useful device for students to learn about, since hysteresis is an important concept in detecting signals. In fact, it might not be a bad idea to have the code that detects the frequency and turns the LED on or off have some hysteresis, as code that just uses a time-out for debouncing tends to make the LED flash on and off when a near-touch is done. Students would have to measure their oscillator waveforms on the oscilloscope, then play with the constants in the code to get reliable switching. It’s still not a 3-hour lab, but it gives another view of hysteresis. I’ll have to think about this some more. I had a good discussion with Steve P. this afternoon about the order and purpose of the labs I’ve designed so far. He’ll be putting together a list of EE topics we have to cover to coordinate with the labs, so that students will have enough theory to do each lab, but not be overwhelmed with theory that they don’t yet have a use for. I’ve designed the labs mainly around the interests of bioengineering majors, but I’ve tried to keep in mind other possible students, such as Digital Arts and New Media students, who would be interested in practical sensor circuits for interfacing to art projects (particularly for inputs to Arduino microprocessors). The first lab will consist of 3 parts, all involving the use of a Vishay BC Components NTCLE413E2103F520L thermistor. First, the students would use a bench multimeter to measure the resistance of the thermistor, dunking it in various water baths (with thermometers in them to measure the temperature). They should fit a simple curve to this data (warning: temperature needs to be on an absolute scale). Second, they would add a series resistor to make a voltage divider. They have to choose a value to get as large and linear a voltage response as possible at some specified “most-interesting” temperature (perhaps body temperature, perhaps room temperature, perhaps DNA melting temperature). There should probably be a pre-lab exercise where they derive the formula for maximizing . They would then measure and plot the voltage output for the same set of water baths. If they do it right, they should get a much more linear response than for their resistance measurements. Finally, they would hook up the voltage divider to an Arduino analog input and record a time series of a water bath cooling off (perhaps adding an ice cube to warm water to get a fast temperature change), and plot temperature as a function of time. EE concepts needed: voltage, resistance, voltage divider, notion of a transducer. Note: Mylène suggested that we start student familiarization with the test equipment by having them use the multimeters to measure other multimeters. What is the resistance of a multimeter that is measuring voltage? of one that is measuring current? what current or voltage is used for the resistance measurement? We might want to do this first. Mylène suggested that we start oscilloscope familiarity by looking at the output of power supplies. What ripple can you see on the voltage output of a benchtop supply? of a cheap wall wart? This requires the students to learn the difference between DC and AC input coupling for oscilloscopes. I think that we may be able to teach what we need here without measuring the power supplies, though that is a good backup plan. First, we would have the students measure and plot the DC current vs. voltage for the microphone. The microphone is normally operated with a 3V drop across it, but can stand up to 10V, so they should be able to set the Agilent E3631A power supply to various values from 0V to 10V and get the voltage and current readings directly from the bench supply, which has 4-place accuracy for both voltage and current. There is some danger of the students accidentally delivering too much voltage and frying the mic, but as long as they get the polarity right, that isn’t too big a hazard. Ideally, they should see that the current is nearly constant as voltage is varied—nothing like a resistor. Second, we would have them do current-to-voltage conversion with a 5v power supply to get a 2.5v DC output and hook up the output of the microphone to the input of the oscilloscope. Input can be whistling, talking, iPod earpiece, … . They should learn the difference between AC coupled and DC coupled inputs to the scope, and how to set the horizontal and vertical scales of the scope. Third, we would have them design and wire their own DC blocking filter (going down to about 1Hz), and confirm that it has a similar effect to the AC coupling on the scope. Fourth, they should play sine waves from the function generator through a loudspeaker next to the mic, observe the voltage output with the scope, and measure the voltage with a multimeter, plotting output voltage as a function of frequency. Note: the specs for the electret mic show a fairly flat response from 50Hz to 3kHz, so most of what the students will see here is the poor response of a cheap speaker at low frequencies. Those with extra time could look at putting the speaker and mic at opposite ends of tube and seeing what difference that makes. First, we would have the students attempt to measure the resistance of a saline solution using a pair of stainless steel electrodes and a multimeter. This should fail, as the multimeter gradually charges the capacitance of the electrode/electrolyte interface. For the safety of the lab equipment, we should have the beakers with salt water in a secondary containment tray at all times. Second, the students should again use a voltage divider, with 10–100Ω load resistor, but with the function generator driving the voltage divider. The students should measure the RMS voltage across the resistor and across the electrodes for different frequencies from 3Hz to 300kHz (the range of the AC measurements for the Agilent 34401A Multimeter). They should plot the magnitude of the impedance of the electrodes as a function of frequency and fit an R2+(R1||C1) model to the data. A little hand tweaking of parameters should help them understand what each parameter changes about the curve. Third, the students should repeat the measurements and fits for different concentrations of NaCl (we’ll have to get a liter or so of each stock solution made up by one of the wet labs). Seeing what parameters change a lot and what parameters change only slightly should help them understand the physical basis for the electrical model. The color of a well plated electrode will be light gray to a purplish gray. While plating, occasionally reversing the polarity for several seconds tends to deepen the chloride coating and yield a more stable electrode. Fifth, the students should measure and plot the resistance of a pair of Ag/AgCl electrodes as a function of frequency (as with the stainless steel electrodes). We’ll have to think of an easy way for them to mount their electrodes so that they don’t move and so that the silver-copper interface is not near the salt water. Sixth, if there is time, measuring the potential between a stainless steel electrode and an Ag/AgCl electrode. EE concepts: impedance, series and parallel circuits, variation of parameters with frequency. Electrochemistry concepts: At least a vague understanding of half-cell potentials. Ag → Ag+ + e-, Ag+ + Cl- → AgCl. I don’t know the details of this lab, but Steve P. has a PC board that samples and digitizes an input with an 8-bit ADC, then reconstructs the waveform with a DAC. He has worked out a lab for explaining and demonstrating aliasing of sampled signals using this board, a signal generator, and a dual-trace oscilloscope. I’ll have to borrow the board and the lab handout from him to see if there is anything in the lab I’d want to tweak. EE concepts: quantized time, quantized voltage, sampling frequency, Nyquist frequency, aliasing. Lab skills: dual traces on oscilloscope. Use an op amp to build a simple non-inverting audio amplifier for an electret microphone, setting the gain to around 6 or 7. Note that we are using single-power-supply op amps. If this lab is too short, then students could feed the output of the amplifier into an analog input of the Arduino and record the waveform at the highest sampling rate they can with the software we provide (probably around 300–500 Hz). This would again demonstrate aliasing. The students would build an op-amp oscillator (a square-wave one, not a sine wave) whose frequency is dependent on the parasitic capacitance of a touch plate, which the students can make from Al foil and plastic food wrap. Students would have to measure the frequency of the oscillator with and without the plate being touched. We can provide a simple Arduino program that is sensitive to changes in the period of the oscillator (see example in Capacitive sensing with op amps, continued) and turns an LED on or off. Lab skills: more messy breadboarding. Frequency measurement. Since optical detection is such an important part of many biomolecular lab techniques, I really want to do something with an LED and phototransistor (or CdS cell or photodiode), but so far none of my ideas have worked out. I have a nice Fairchild QRE1113 reflectance sensor that uses a matched 940nm wavelength LED and phototransistor, which I’ve used a tachometer for motors for the robotics club. Unfortunately, a tachometer is more appropriate for a mechatronics lab than a biengineering circuits course. I thought that I might be able to use it to measure arterial pulses by reflection, but I don’t seem to get a signal at my heart rate (I did better with the uncomfortable ear clip). The reflectance sensor is good for measuring finger tremor if you hold a finger close to (but not touching) the sensor. The effect is optical, not capacitive coupling, since the signal is stronger if a non-conducting white piece of paper is held near the sensor rather than a finger. The reflectance sensor is remarkably insensitive to ambient light, though shining a laser pointer on the sensor is easily detected. We can easily do labs involving interrupting light beams, but there isn’t much “circuit” stuff for the simple ones and not much “bio” stuff either. We could up the circuit content (perhaps too much) by modulating the light beam and using a synchronous demodulator to detect the beam even in the presence of high ambient light. I still need to find something that is feasible and somehow related to bioengineering. This needs more thought. I’m still missing a lab. I’ve not done anything with position, pressure, or volume sensing yet. Of course, it is possible that some of the earlier labs will take longer than I think, and we’ll need to slip the schedule anyway. The EKG lab looks pretty packed, so may be some portion of that could be foreshadowed here. Perhaps bandpass filtering and characterizing a simple filter? That would be useful, but rather boring. Maybe an electronic music lab of some sort would be fun here? The electrocardiogram will be the final project for the course, and I think it will take two full lab sessions. The first lab session would consist of soldering up the instrumentation amp protoboard, checking for opens and shorts, and designing and characterizing a differential amplifier with an adjustable gain of about 100–1000 (including AC coupling to eliminate problems with DC offset saturating later stages). The amplifier should have a bandwidth of about 0.01Hz–150Hz. The second one would be and making a twisted-wire harness with alligator clips to attach to the EKG electrodes, connecting the amplifier to the electrodes, debugging the student-designed EKG amplifiers, and adjusting the gain. I suspect that a few students will get a design that works in the first week, but that a lot of students will be doing a lot of unsoldering and resoldering as they find bugs in their design, hence the need for 2 weeks in the lab. Student check out will require that they be able to blink an LED in time with their heart beat, display the EKG waveform on the oscilloscope, and record a minute of EKG signal at 200 samples/second using the Arduino, all without adjusting their board between demos. EE concepts: biopotentials, instrumentation amplifier, common-mode signal, differential signal, twisted pair wiring, grounding to avoid common-mode signal saturating an instrumentation amplifier, Ac coupling, simple bandpass filtering. I have a pretty clear idea how I think the lab part of the course should start and how it should end, but there are a couple of weeks just before the end that are still a bit vague. Perhaps as Steve starts aligning the EE topics with the labs he can identify some topics that need a lab exercise to clarify them. Maybe some of my blog readers (those who haven’t deserted me during this long process of designing a course) can make some more suggestions—even repeating some old suggestions would not be a bad idea now, as I need a creative kick. What more can I do (or, more importantly, have the students do with the Capacitive sensing with op amps? The circuit that I gave in that post has several parameters. Perhaps the students should try predicting what happens when they are adjusted. For example, what happens if Vbias is raised or lowered? What is the effect of changing each of the resistors? How can we optimize the circuit for easy, reliable detection of touches with an Arduino pulseIn() measurement? If we pretend that the output is a rail-to-rail square wave (ignoring the slew rate limitation), analysis is pretty easy. If the output is low, then and Vminus is higher than that, but dropping. If the output is high, then and Vminus is lower than that, but rising. If we define , we can simplify further and say that Vminus swings between two threshold voltages: and . The discharging curve is simply , where , so it takes to discharge to the other threshold. The charging curve is , and so it takes . That is, . If we want a symmetric waveform, we need to have , which in turn requires . Raising Vbias makes the low part of the output waveform shorter and the high part longer. Conversely, lowering Vbias makes the low part longer and the high part shorter. The total period is . If we set Vbias to Vdd/2, then we can simplify further to . The sum R4+R5 only affects the amount of current that the Vbias supply has to provide, but it is probably a good idea to make it fairly large, and to add a bypass capacitor to Vbias, to prevent noise coupling though the bias supply. When using pulseIn() on the Arduino to measure the capacitance C1, we want to have a large change in the pulse duration (to avoid quantization effects from reporting the duration in μsec), which means a large value for R3. That is limited by the problem of picking up 60Hz noise if the input impedance is too high. We can also tweak r=R5/R4 a little, to make the period a larger multiple of τ, limited by the problem of noise if we get the thresholds too close to the rails. Since pulseIn() only measures one part of the waveform (the low part or the high part), we could also tweak the bias voltage to lengthen just that part of the waveform, for example, dropping Vbias to Vdd/4 to length the low part. We again have to be careful not to get the threshold too close to the rails. If we are lowering Vbias, then the threshold to watch is . If we fix as low as we’re willing to make it, then should we make Vbias low or r high? The number we are trying to maximize is the discharge time , with the constraint that . At equality, we have to maximize , which is achieved by making r as large as possible. Of course, that would mean raising Vbias, which would run us into trouble with noise at the other threshold. In general, it seems like the symmetric waveform with Vbias=Vdd/2 gives us the best noise margins. Next step: how do we either slow down the oscillator or clean up the waveform enough to get a good signal to feed into the Arduino? I tried increasing both R1 and R5, while decreasing R4, as shown below. This circuit oscillates with a frequency of 35.66 kHz (period of about 28 µsec )when the touch sensor is not touched, which is slow enough that the signal runs from rail to rail. Touching the sensor drops the frequency to 20kHz or less (period of 50 µsec or more). Since r=5.556, the expected period is 4.988 τ, or 0.4988 µsec/pF C1. The period is consistent with a stray capacitance of 56 pF, increasing to over 100 pF when the sensor is touched. There is a lot of jitter in the lower-frequency signal, probably due to some coupling of 60 Hz noise into the system. A 1nF capacitor for C1 gives a frequency of 1660Hz (602 µsec, which is more than the expected 500 µsec), 47nF gives 34.65 Hz (28.86 msec, not the expected 23.44 msec). Why am I consistently 25% off? The change of 20 µsec or more in the period (10 µsec or more in the half period) should be easily detectable with one pulseIn() measurement on the Arduino. The following code seems to work fairly well, with a light touch causing the LED to flash (right on the edge of detection) and a firmer touch giving a steady reading. // pin CAP_PIN on the Arduino. // The code turns on the LED on pin 13 when a touch is sensed. // The Arduino measures the width of one LOW pulse on pin CAP_PIN.